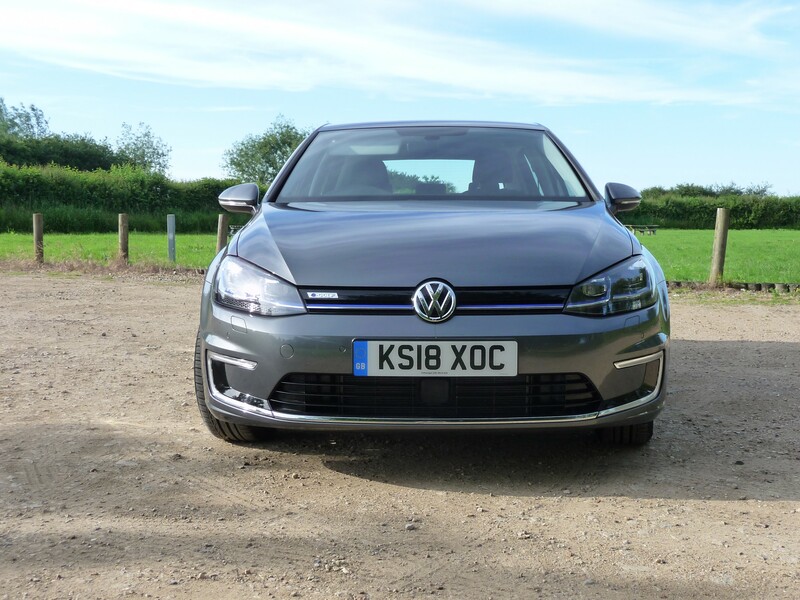 Our long-term e-Golf has returned to Volkswagen after six months and more than 6,000 miles, and – much like its driving experience – our time with it couldn’t have gone much smoother. Thanks to the installation of a 7kW Pod Point charging unit at home, the car slotted seamlessly into my day-to-day life. With an official range of 186 miles, I could do my 76-mile commute to work and back with, typically, an indicated 70 miles left. It was then just a case of plugging into my home charger and within a few hours the battery was full again. As it was my first fully-electric long-termer, I did initially suffer from slight range anxiety. However, a couple of 134-mile round trips left me with around 20 miles remaining and soon after I completed a 150-mile journey with three miles of range left, which quelled any further nervousness. After that, I’d happily use it for trips of up to 130 miles without a second thought. I also made significant savings in fuel costs: I charged the car almost exclusively at home which increased my electricity use by around £10 a week, whereas I would usually be spending around £45 a week on petrol or diesel. Other aspects of the ‘ownership’ experience also impressed. 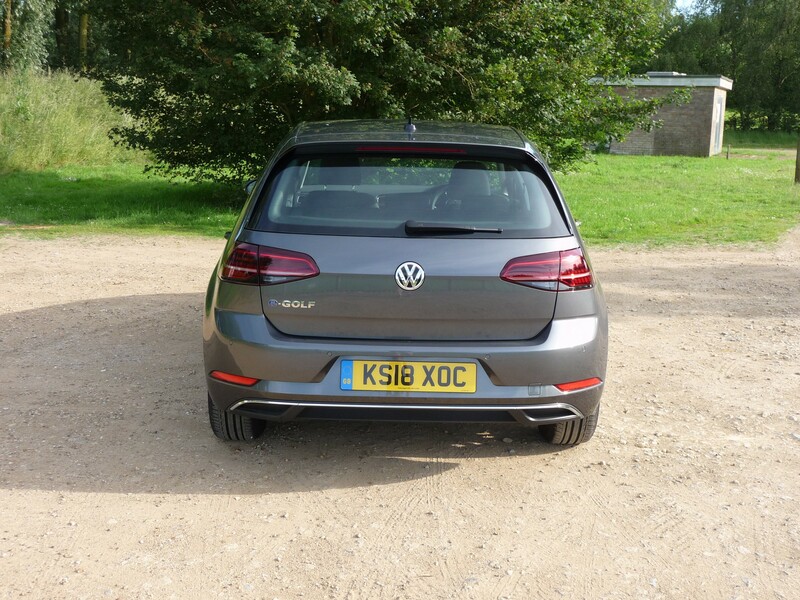 The fact it is based on a ‘normal’ Golf gives it an advantage over its direct rivals as it offers a more premium feel, both in terms of its build quality and driving experience. The electric powertrain allowed for near-silent running, meaning refinement is high, while the car’s impressive ride comfort ensured it was excellent to live with. Any downsides? 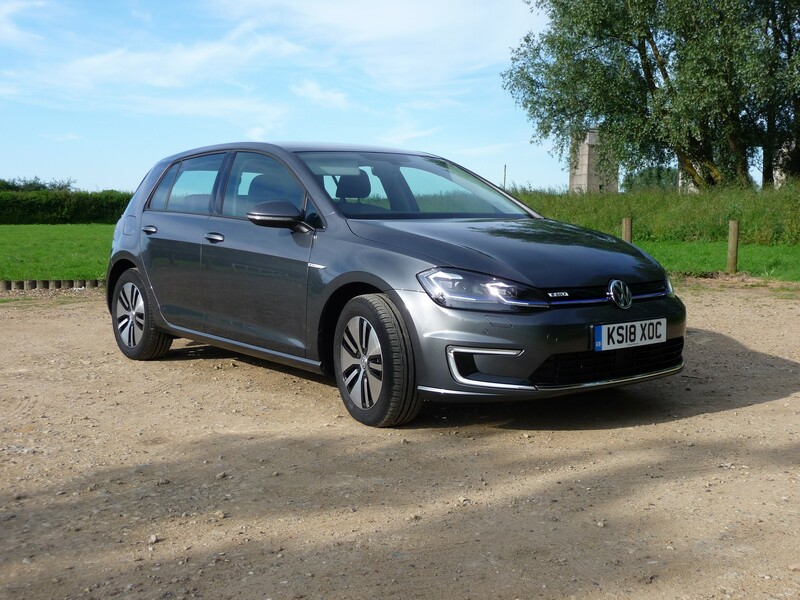 Apart from the fact it’s gone back, the e-Golf’s official range is less than that offered by cars such as the Hyundai Kona Electric (up to 300 miles) and Nissan Leaf (up to 235 miles), but apart from that, any drawbacks are few and far between. It used to be fashionable for car magazines to use a set of golf clubs to demonstrate the size of a vehicle’s boot. Inadvertently, I seem to have created a sub-genre of this: the manure test. This not only tests the practicality of a car, but also how smooth it is to ride in and drive – something which is critical given that the manure sacks being carried are not sealed (the vehicle interior is securely lined with tarpaulin, so any spillage would be easily cleaned up). For the past few years, I’ve tried to channel my inner Monty Don to transform my back garden but have been hindered by my lack of design skills, indecision and the poor quality of soil. This has meant that, for the third consecutive year, I’ve made the trip to a local paddock to pick up sacks of well-rotted horse manure to improve the soil. In the first year, the Honda Jazz proved capable due to its low boot lip and the mechanism which allows its seats to fold completely flat. Last year, I used our Ford S-Max which, as a large MPV, had much more space than I needed. But as both were manuals, the 10-mile trip home was more worrisome than it could have been, as the need to change gear smoothly increased the concentration levels needed to negotiate the roundabouts and speed bumps en route. The e-Golf, however, was a different story. The rear seats don’t fold down to form a completely flat load area, but it still fitted 13 medium sized sacks in. One of the car’s strengths is how smooth it is to drive and ride, helped by its single-speed gearbox. This ensured the journey home was relaxing, with no risk of spilling even a drop of manure! The moment I had been dreading arrived last week. I had to give my first domestic electricity meter reading since taking on our Volkswagen e-Golf long-termer three months ago. Historically, I didn’t use a lot of electricity, partly because of my widespread use of energy-efficient appliances and light bulbs, meaning I enjoy low energy bills. I knew this was going to change due to taking on the electric e-Golf, especially as I was going to charge it almost exclusively at home after using it for my 75-mile round-trip commute. So, the day before taking delivery of it I submitted meter readings to gain an accurate insight into what the EV was costing me to run. When I logged into my energy supplier’s website last week to give my meter reading I feared the worst as my online account asked me to re-enter my latest figures because they were ‘higher than expected’. On the face of it, it didn’t look great. My electricity consumption had more than trebled from an average 3.52kWh of electricity a day to 13.66kWh, an increase equivalent – according to my electricity supplier – to running a washing machine 14 times a day. Fortunately for my bank account, this sounds more dramatic than it really is. In reality, it has meant I’ve used £122 more electricity in that three-month period than I did last year, equivalent to around £10 per week. Had I continued to use my previous long-term test car – admittedly a Ford S-Max 2.0 TDCi Titanium X AWD returning only 40mpg – over the same period for commuting, that would have cost around £56 a week on fuel. So, the EV represents a significant saving. 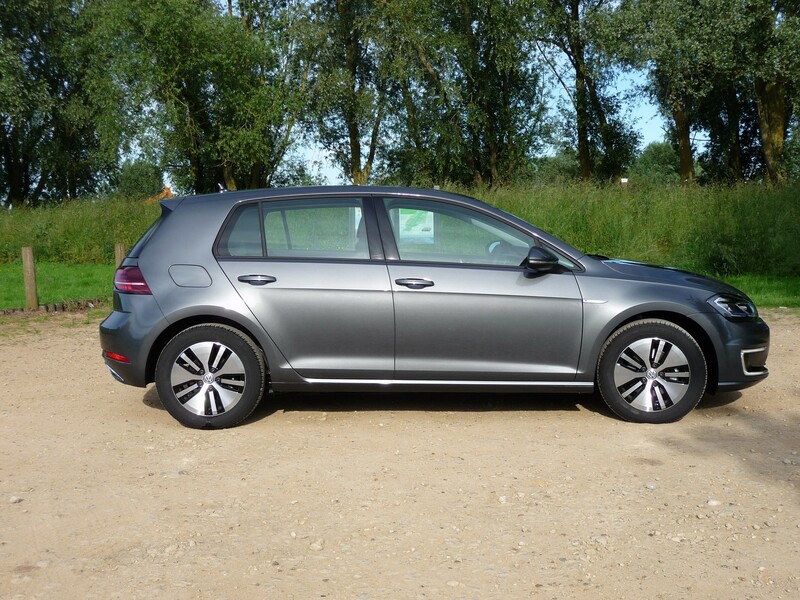 Confession time: I haven’t been 100% faithful to our Volkswagen e-Golf long-termer. When it arrived I intended to put range anxiety to one side and use it regardless of journey length. If it was a round trip longer than its range, I was prepared to divert to find a public charge point and wait until it took sufficient power on. However, my resolve to do this disappeared when the reality of doing it all the time dawned on me. I switched to a diesel for a friend’s stag weekend in Dublin. We flew from Birmingham and could easily have made it there from my Norfolk home on one charge, but I took a diesel for two reasons. Firstly, there are charge points at the airport but I didn’t want to occupy one all weekend, thus stopping anyone else from using it. Secondly, I felt that after we landed back in Birmingham, my passenger and I would want to get home as quickly as possible and not wait hours for the car to charge sufficiently. The other reason has been simplicity when it came to claiming business mileage reimbursement. As I charge from home I pay for the electricity, but Bauer Media has had no policy on how to reimburse pure EV drivers for business mileage. In the end we settled on using a formula suggested by The Miles Consultancy, which involves calculating the actual cost based on the e-Golf’s battery size, range, and my electricity tariff. This took some time to agree, so it has been easier to take a petrol or diesel car and claim mileage in the traditional way. 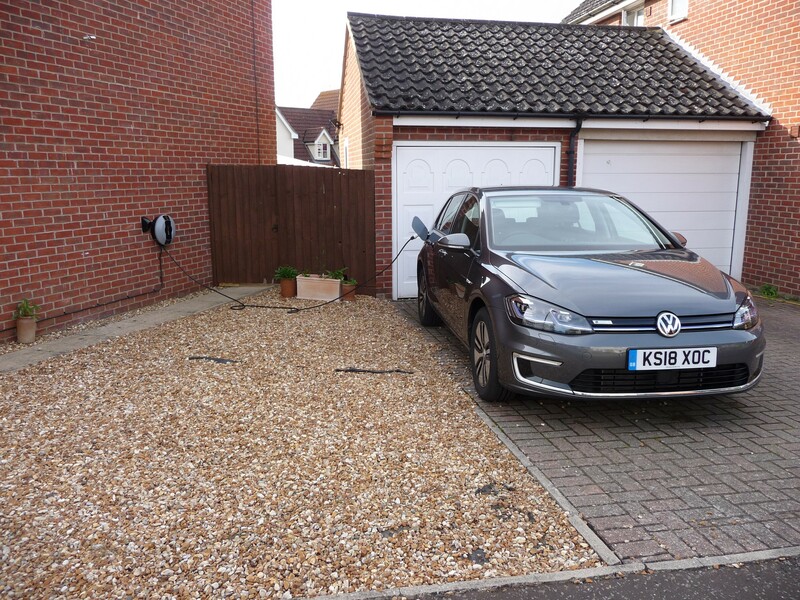 However, as the HMRC has now announced AFRs for pure EVs , this obstacle to using the e-Golf for business has disappeared. Life with our Volkswagen e-Golf couldn’t be going any more smoothly – both in its day-to-day operation and in the way it drives. Over the 1,534 miles I’ve been behind the wheel so far, the electric powertrain and automatic gearbox have made it a hassle-free experience as well as exceptionally quiet: its refinement levels are excellent, a quality hammered home when I borrowed a ‘noisy’ diesel SUV for a couple of days. The e-Golf’s range has also seen me settle into a comfortable routine. As I wrote in my last report, the 75-mile round trip to work is taken in its stride, usually with an estimated 65 miles of range left. I then plug it into my home Pod Point charge point for a few hours, and it’s fully charged and ready to go again. Range-wise, its biggest challenge so far has been taking it to our two-day Company Car in Action event, held at the Millbrook Proving Ground in Bedfordshire. 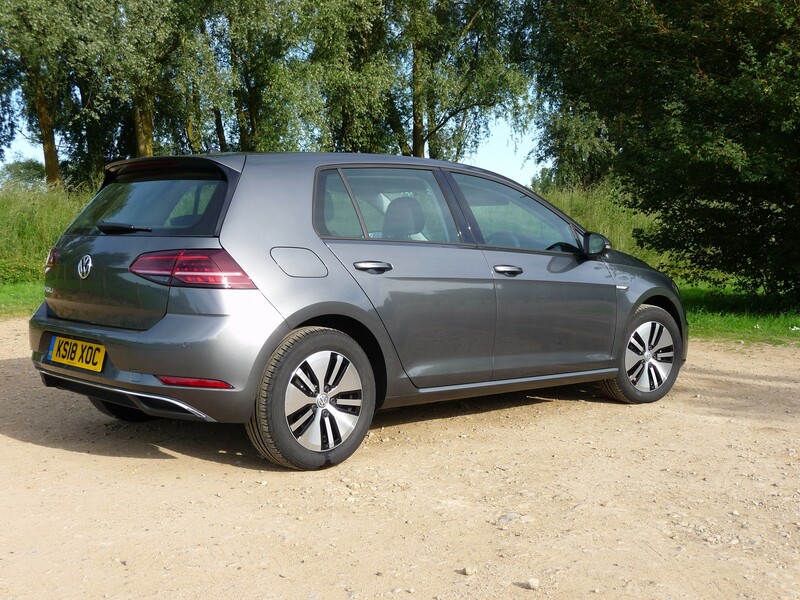 This was a 134-mile round trip: 10 miles more than the real-world range Volkswagen gives for the e-Golf, although its official NEDC range is 186 miles. My previous experiences had suggested this was well within the capabilities of the car, but still led to slight range anxiety before I set off. For these journeys, I selected ‘eco’ mode, which limits the car’s top speed to 72mph and reduces the motor output from the standard 115PS to 94PS. It also reduces the output of the climate control. A further Eco+ mode is also selectable which limits the top speed to 56mph and the power to 74PS. At the end of the first day, I still had an estimated 18 miles of range remaining, with 22 miles left on the second, suggesting 150 miles easily achievable. Any range anxiety was again misplaced, making the transition to driving a full EV more straightforward than I had considered it would be. 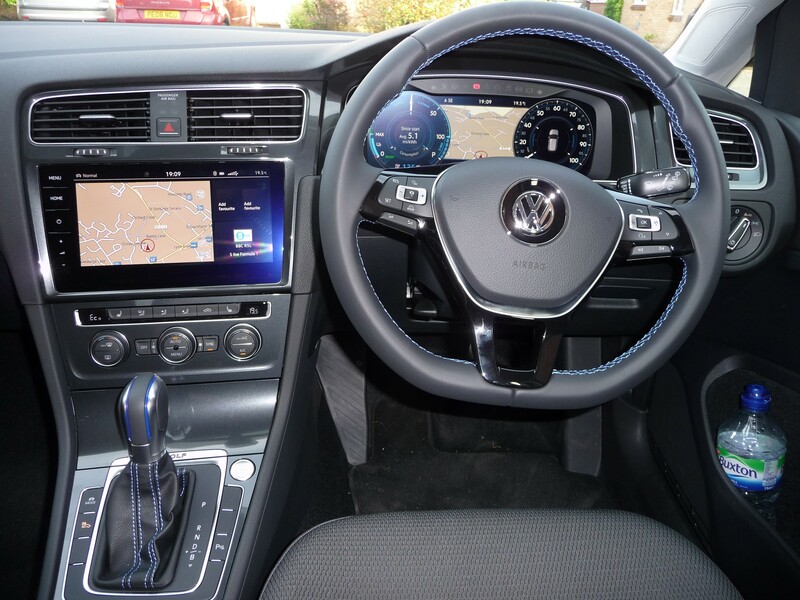 I’ve been lucky enough to run some excellent cars as long-termers in the past, but I can’t remember being as excited at the prospect of taking one on as I have been with the Volkswagen e-Golf. A large part of this is down to the opportunity to run an electric car over a six-month period. Not that long ago, running an EV on a daily basis would not have been a realistic or practical option for me. I have a 75-mile round trip to Fleet News’s office in Peterborough and, without guaranteed access to a chargepoint at work, the restricted range of earlier models would have made life difficult for me. However, the current generation of EVs with ranges well in excess of 100 miles has changed that. 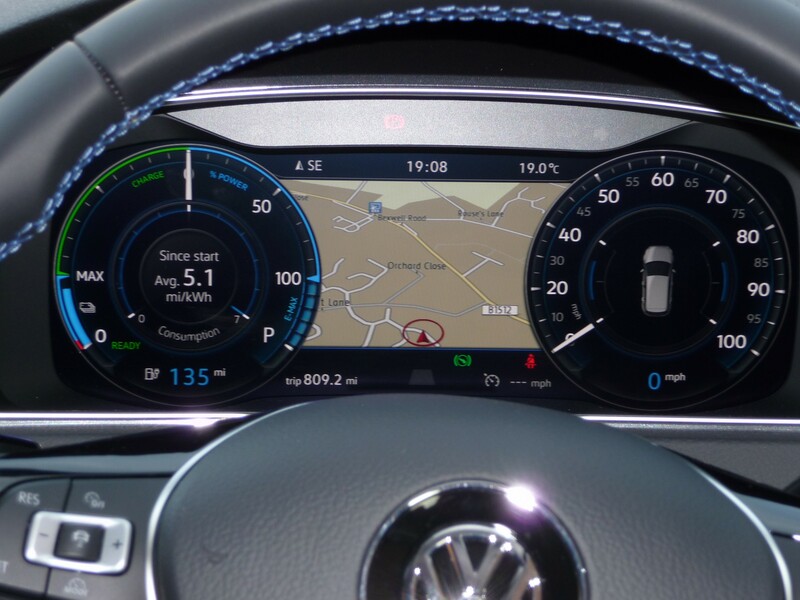 Under the outgoing NEDC testing regime, the e-Golf has an official range of 186 miles, with Volkswagen saying that translates to a real-world distance of 124 miles. Early experiences indicate that the manufacturer’s figures are conservative – I usually get home from work with around an estimated 65-70 miles left, bringing the range up to around 150 miles. This positive start is typical of my experiences so far. I’ve had a Pod Point 7kW charger installed at home, and the entire process of ordering, booking an appointment and having it fitted couldn’t have been easier. The engineer who installed the chargepoint was knowledgeable and was able to clearly explain how to use the technology. The charger adds about 30 miles of range per hour, so all I need to do on a daily basis is to plug the car in for a few hours when I get home, and then it’s fully charged again. The driving experience has impressed too. It’s noticeably quieter than a comparable petrol or diesel car, while the instant power delivery means it is smooth and responsive on the road. All of this means that my introduction to EV ‘ownership’ has been overwhelmingly positive.